Throughout months of candidate forums, town hall meetings and videoconferences, we joined thousands of SEIU members across the state in meeting face-to-face with candidates for governor and engaged with them on issues affecting our jobs, our families and our communities. Politics matter, and we want to ensure that whomever we support for governor is the best partner in improving the lives of state workers and all Californians. 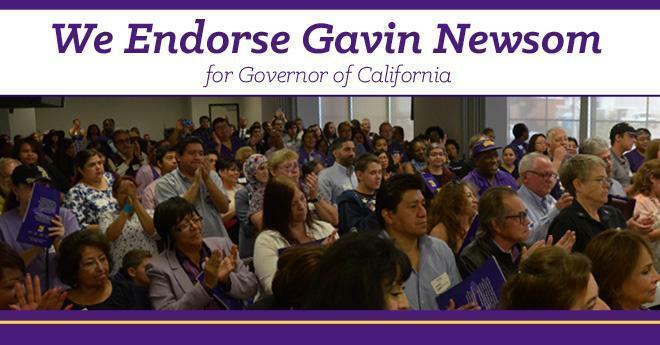 Now, following the culmination of our months-long endorsement process and reaching a recommendation, we are proud to announce our official endorsement for Gavin Newsom. Today the SEIU California Executive Board reviewed member recommendations from locals across the state, including Local 1000, and voted on one unified endorsement. Our work to elect a governor who will partner with us on our issues is not over yet. Our endorsement carries our backing and commitment to continue to support Gavin Newsom by knocking on doors and calling fellow members to get out the vote. We know that whom we choose to elect affects every aspect of our lives. Whether building power at the bargaining table, protecting our retirement security or ensuring our communities are strong and vibrant, we harness the power of 96,000 members to improve not only our lives but also the lives of all Californians. We will continue to use our voice – and our vote – to protect our rights and our vision for all Californians to have the opportunity to have a good life, live in sustainable communities and enjoy the fruits of social, economic and environmental justice.